Our interdisciplinary research portfolio is focused on the translation of modern x-ray physics concepts to biomedical sciences and clinical applications. We are particularly interested in advancing conceptually new approaches for biomedical x-ray imaging and therapy. From a medical perspective, our work currently targets early cancer and osteoporosis diagnostics. We develop novel scientific devices and methods for applications in biomolecular physics, biological chemistry, and molecular medicine. To this end, we currently focus on using DNA as a programmable construction material for building nanometer-scale scientific devices with atomically precise features. We also customize proteins and create and study hybrid DNA-protein complexes. 3D transmission electron microscopy, atomic force microscopy, and single molecule methods such as optical trapping and fluorescence microscopy are among our routine analysis tools. The function of proteins and nucleic acids in living systems is strongly coupled to the molecular motion and dynamics of these biomolecules. 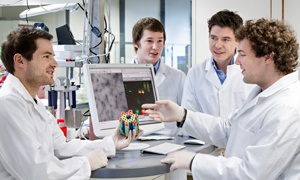 Our group uses computer simulation methods to study the structure, function and dynamics of biomolecules. Our goal is to better understand structure formation processes and to elucidate the mechanism of ligand-receptor association in atomic detail. Proteins are fascinating examples of self-organized molecular machines. Without any help a polypeptide strand can fold into functional threedimensional structures. We are interested in studying the function and folding process of proteins on the single molecule level. Examples are single molecule folding/unfolding studies or the motility of molecular motors in optical traps. 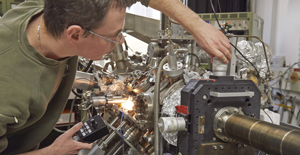 We develop novel X-ray imaging methods using highly brilliant synchrotron radiation and conventional laboratory X-ray sources. We mainly focus on quantitative multi-modal approaches combining spectral and phase-contrast imaging. Currently, we are aiming at applying these methods for improved breast cancer detection and for quantitative 3D virtual histology of human tissue. Our basic research goal is to understand the basic units of information processing in the brain. In order to explore the underlying universal principles we focus on sensory systems in the animal world. We search for systems that are on the one hand simple enough to allow a thorough understanding of the system, but on the other hand complex enough to show interesting behavior. In this way, we try to identify fundamental processes that underlying information processing in the brain. Experimental verifiability always plays an important role in our research and we prefer to work together with experimentalists to get an optimal understanding of the problems we are dealing with. In physics, interactions between particles follow laws. In biology, interactions between biomolecules serve a function. We study the physics of biological functions. In particular, we are interested in cases where the implementations of biological functions are constrained by physical principles. Methods from statistical physics help to describe the functioning of complex biomolecular systems on a coarse-grained, but quantitative level. Understanding complex biomaterials on a fundamental physical basis is an integral challenge of future biophysical research. This challenge can be addressed by the concerted application of new experimental tools of soft condensed matter physics to living cells and bio-mimetic model systems. In our group we concentrate on the one hand on developing new physical tools to address the underlying complexity and mechanisms and on the other hand on developing new biomaterials for applications ranging from biomedicine to functional food.